A light rum made in Santa Cruz del Norte, Cuba, this has a warm, golden glow and intense aromas of honey and vanilla following through on the silky smooth palate. 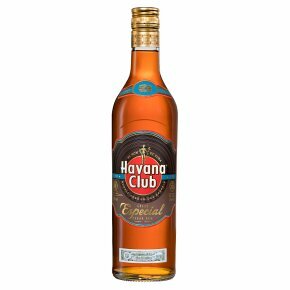 Havana Club Anejo Especial is the perfect base for a Cuba libre or can be enjoyed on the rocks for its full flavour and rich finish. Premium Aged Cuban Rum. The natural ageing process in young oak barrels in Cuba for a number of years gives Havana Club Añejo Especial its warm amber colour and smooth taste. Aged in this way, it develops a typical touch of vanilla that is perfect for mixing with cola or just with ice. The best way to savour this special rum is in typical Cuban style - together with your best friends. Authentic Cuba Libre Ingredients: Few drops of lime or lemon juice 50 ml of Havana Club Añejo Especial 100 ml of Cola Other than that, you'll need a highball glass and fresh ice. Method: First, fill the highball with fresh ice. Then you'll want to add 50ml of rum, Havana Club Especial because it is barrel aged with a hint of vanilla, adding a rounder taste. It's perfect for mixing because it really complements the other flavours that surround it. Now, top it up – with no more than 100ml of cola.… leaving just enough space for the garnish, a lime wedge. Salud!